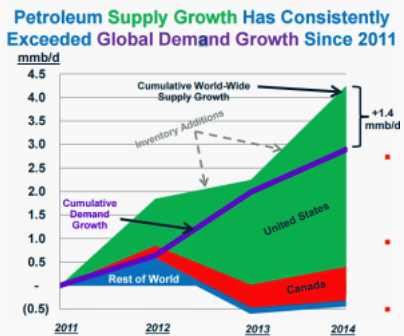 Last week the U.S. became the world’s biggest crude oil producer. Not everyone agrees – Russian production figures still show them ahead. But the Energy Information Administration (EIA) is confident that we are, and that we’re going to stay there at least through next year. This represents a milestone in the path towards American Energy Independence. Only 10 years ago, U.S. output was 5 Million Barrels per Day (MMB/D) and was in decline. Today it’s reached 11MMB/D and is growing rapidly.Horizontal drilling and hydraulic fracturing unlocked the huge reserves in shale formations, and the decline was arrested. Over the next several years U.S. output grew sufficiently to more than meet global demand growth. In 2014 Plains All American (PAGP) produced a powerful chart showing how North American crude was gaining market share. OPEC finally tired of their commensurate lost share which they believed was hurting their revenues. The subsequent 2014-16 energy sector collapse was OPEC’s attempt to bankrupt America’s nascent shale industry. Although the financial pain was widespread, the industry didn’t break. 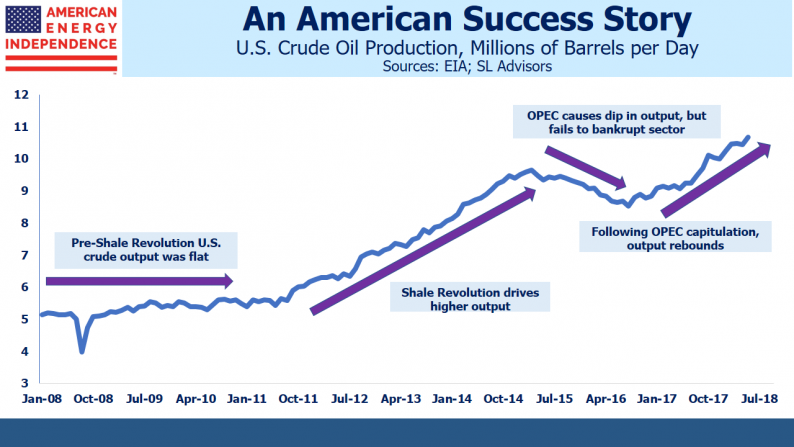 American capitalism responded – costs were slashed, productivity enhanced and a leaner, stronger shale industry emerged. OPEC relented (see OPEC Blinks), concluding low prices were damaging their members more than the shale upstarts. U.S. production began rising again. It passed its 2014 high last year, and last week took the world’s top producer spot, well ahead of many forecasts. It’s an epic story, with significant consequences across geopolitics, trade and the environment. America’s improved energy security is underwriting a more robust approach to Iran. In the 1970’s, support for Israel in its wars against Arab states led to gas lines as OPEC’s flexed its muscle and imposed an oil embargo. American exports of Liquefied Natural Gas (LNG) are creating new trade opportunities with Asia, where South Korea, China and Japan are among our biggest buyers. In spite of the escalating tariffs with China, they recently exempted U.S. crude oil imports from a list of items subject to new tariffs. Germany’s plan to buy more natural gas from Russia via Nord Stream 2 is more easily criticized when U.S. LNG is available. Trump’s tweet, “What good is NATO if Germany is paying Russia billions of dollars for gas and energy?” is hard to fault.